Today was the launch of the much anticipated collaboration of the french fashion house Isabel Marant with H&M. Usually collaborations initially excite me but then fizzle out because they end up being over the top and not really every-day worthy wear. In addition, the quality of collaborations tend to be much less than the original designer would deem worthy and leave you scratching your head wondering "what happened???". I decided to check out H&M at Pacific Centre on my lunch break. I really didn't have crazy expectations because I figured it would be extremely picked over or just plan "cheap" looking. Well Isabel Marant, you deserve 10 out of 10 because not only did you stick to your usual style but for the quality, the prices are extremely reasonable. Not only were there a few good designs left over but each piece was well-made and completely worthy for every-day wear. 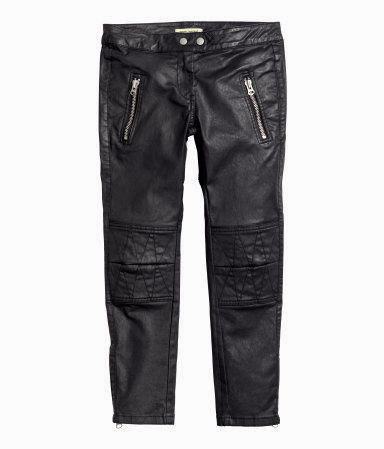 I ended up picking up the Waxed Biker Pants, I absolutely love them and can't wait to rock them tomorrow at the office for casual friday. The pants feel very well made, have amazing detail and even though it does not have belt-loops, I will just take them into the tailor to have them added in the future. I am usually a size 2 - 4 but I was able to purchase the size 6 (only one left in the entire store) and although a bigger size than usual, they fit me perfectly. The in-seam is probably a 30 inch as I usually wear a 32 inch and the pants just came to my ankles but are perfect for my 5 foot 2 inch frame and will be great to wear with boots or heels. With runners they will even be better because the bottoms won't scrunch up needlessly. Go check the collaboration out either in store or online, you won't be disappointed and the added bonus is that H&M has a 7 day full refund policy so if you can't find something right away, keep an eye out for it in the next couple days, perhaps someone might get retail-therapy guilt and return some great pieces that they initially purchased.